For information on careers and culture, contact HR. The Cleveland Foundation strives to attract, develop and retain the most talented individuals as a part of our team. We are highly committed to providing a work environment that supports these efforts through our values-based culture, competitive pay, exceptional benefits, developmental opportunities and work-life balance. Always guided by our mission, vision and values, the Cleveland Foundation celebrated our centennial in 2014 as the world’s first community foundation, the community’s largest grantmaker and one of the philanthropy field’s leading institutions. An expression of who we are. 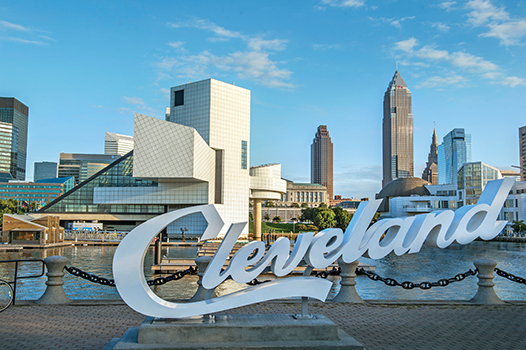 The Cleveland Foundation’s mission is to enhance the lives of all residents of Greater Cleveland, now and for generations to come, by working together with our donors to build community endowment, address needs through grantmaking and provide leadership on key community issues. An expression of our aspirations. The Cleveland Foundation will use the power of philanthropy to enable Greater Cleveland to be a great and global American city. Together with our donors and partners, we will make innovative, impactful and internationally recognized contributions to the field of philanthropy. We live up to the highest ethical and moral standards as we fulfill our mission. We honor donor intent, invest wisely, grant fairly, and keep our community’s trust. We strive to be leaders in the community and in the foundation field. We lead the way in philanthropy, addressing community needs and creating opportunities. We think big, prize creativity, move nimbly and are willing to take risks. We take pride in serving our donors, grantees, partners, colleagues and community. We listen, show respect, respond professionally, deliver excellence and go the extra mile. We are open to diverse ideas, challenge the status quo, learn from our successes and failures, seek best practices and improvements and develop talent. We embrace collaboration and inclusion. We are eager to partner, build strong relationships and work as a team. At the Cleveland Foundation, our values drive and shape our culture. Each of us lives these values—leadership, partnership, learning, service, innovation and integrity—every day in our work with colleagues and those in the community. We are proud and honored that our efforts to support our employees have been recognized locally and nationally. 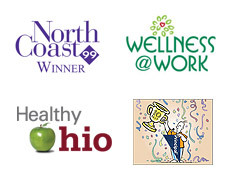 The foundation is a 14-time winner of the NorthCoast 99 award and has also been recognized through the Wellness@ Work awards, the State of Ohio Healthy Worksite award and was named one of the Principal Financial Top 10 Employers for Financial Stability. In addition to the engaging and rewarding work environment, the foundation provides exceptional benefits, a comprehensive wellness program, opportunities for growth and development, and team-based activities that allow employees to interact and get to know colleagues across teams. Donor Relations Officer Paul Putman joined the foundation in 2008. What makes the Cleveland Foundation a special place to work? For me, it’s the combination of the mission and the people. We have an amazing team of professionals, donors, board members, and community partners all working to enhance the lives of all residents of Greater Cleveland. I truly enjoy being a part of an organization that is working so hard to make our community better for everyone. It’s often tough work, but tremendously gratifying. How has the foundation supported your career? The foundation has provided tuition assistance and access to professional development opportunities. Supervisors and senior leadership have worked with me to identify opportunities to expand my competencies and skill sets through a variety of special projects. I’ve also had the privilege of working in positions in two different areas of the foundation, which has broadened my perspective on how our mission is implemented. How does the foundation foster work-life balance? The Foundation cares about its employees as people. This comes directly from our board and senior leadership and is infused throughout the organization. From encouraging our personal wellbeing through onsite wellness coaching and free gym memberships to compassionately supporting us through moments of personal loss or challenges (and also personal celebration! ), most of us would say that we have consistently been treated with respect and genuine caring. Although each department will have its own rhythm of busier times during the course of a year, in general, staff members are able to maintain a work-life balance without having to work excessively long hours or spend hours at home responding to emails. When we go on vacation, we are able to BE on vacation. Grants Manager Diane Kaszei leads a team of Grant Coordinators. How long have you worked for the foundation? I started at the foundation in January 1990 and worked in Grantmaking for 7 years, then left in 1997 for 2 years and returned in 1999 and worked in Advancement for 5 years. Then I returned to Grantmaking – so a total of 25 years! Describe the work environment and culture? I think the work environment is very supportive, and we always have an excellent working space and equipment. The health and wellness of the staff is also always a priority. Overall, the culture is very professional and welcoming! What makes the foundation a special place to work? I have been very lucky to work for and with great people over my time here. I was always encouraged to expand outside of my comfort zone. I have had opportunities for training and continuing education related to management, diversity and team-building through foundation supported courses and events. I was also able to go back to school and complete my bachelor’s degree in 2005. I enjoy working with multiple departments within the organization. The Grants Management team has a role in almost every area, which gives us the opportunity to provide information, resources and support to others. 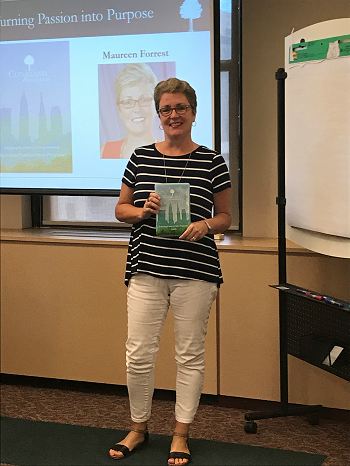 Congratulations to Development Assistant Maureen Forrest who received the fall 2018 Cleveland Foundation “Turning Passion Into Purpose Award” as nominated and selected by her colleagues! Maureen joined the staff in 2007 and has more than two decades of experience in administrative roles. She was recognized for her exemplary service to special projects and for being a team player on a daily basis. Foundation staff regularly honor colleagues with the award for demonstrating our core values in support of the Cleveland Foundation’s mission. In March 2013, the Cleveland Foundation, in partnership with Thompson Hine, ERC and Oswald Companies, began discussions about the possibility of launching a unique networking group whose mission would be to support the nonprofit HR community through education, resource sharing and networking opportunities. All were highly in favor of sponsoring such an effort not only financially, but with time, expertise and resources as well as an understanding from their own nonprofit clients that there is a need to facilitate these connections.